For those mariners who are lucky to have internet access onboard, there should be no problem at all to get weather forecasts on their ships. The only problem is not to drown in the multitude of sites on this subject. Hereunder we'll show some fancy ways to get your daily weather forecast. Just one word of advice: do not blindly trust on one source of meteo info alone. Get more sources available onboard, compare the weather forecasts side by side, and make your conclusions on an broad and relaible base of weather info. One source weather forecasting is always wrong ...Well, they may have missed something, anyway. More sources make for a more reliable forecast. You may find yourself in need of a more frequent (than 24 hourly) weather forecast, for example in the vicinity of a tropical cyclone. For those of you who do not know Google Earth yet: here is why to get started. Once it is installed, you can freely rotate this globe, zoom in and find your own house (the globe consists of satellite photo's glued together). North Pacific: overlayed with infrared realtime satellite image and cloud layers; you can see the Intertropical Convergention Zone (ITCZ) just north of the equator. This Google Earth thing may be helpful in more ways than you imagine. Lately we had to enter Abu Dhabi New Port. This port was not yet shown on Admiralty charts. Finally, we printed an overview of the port, obtained from Google Earth, and used this, together with a survey map, to enter this port. Find a suitable website with frequently updated satellite photos or other weather forecast maps on internet. Go to the Windows Start Menu > Control Panel > Display > Desktop > Customize desktop > Web > Properties. Fill in the URL of that website, and set up a shedule for synchronising. Ready ! The desktop background is now a regularly updated satellite photo or weathermap. 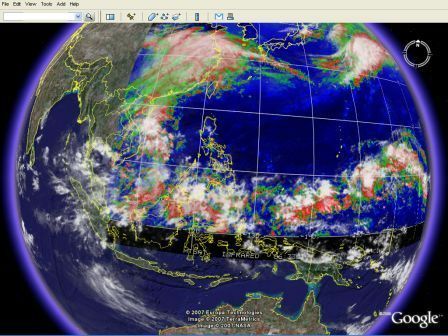 A visible wavelength satellite photo of South China Sea, hourly updated. I live in the Philippines and am subscribed to the email newsletter on http://www.typhoon2000.ph/. 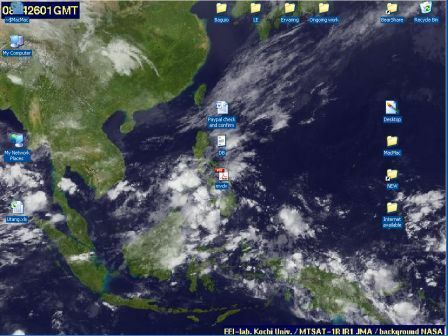 They send me an email as soon as a typhoon starts to develop in the region. It's a perfect early-warning system. I also used it while dredging around Sachalin Island. There may be more of this services for your region, and it's worth finding them. The meteo data are emailed without any extra effort from your side. Some ships do not have broadband internet access, but only a limited bandwidth (56k) or an email-connection. “Saildocs” is a free-of-charge internet service. 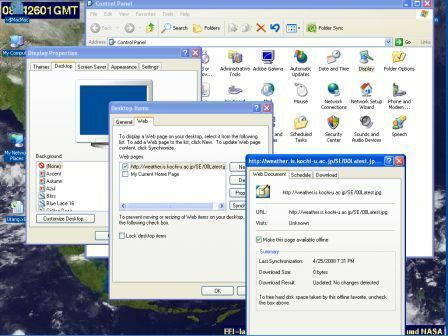 The user sends an email with some simple codes to an internet-server, asking some text and / or image weather forecasts for specified area’s. After a few minutes, the asked weather data is send back to the user by email. The Saildocs-server will return you an email with a helpfile to get you started. Saildocs also has “grabber”software, that allows you to “grab” a *.tiff or *.jpg file from internet through email. If you know beforehand the URL of your weatherchart, you may retrieve charts through this service. FTP-MAIL is a service of “N.O.A.A.”; the National Oceanographic and Atmospheric Administration”, a U.S.A. government institution. to get retrieve weather-data from them through email. You will get a helpfile in return. gcaptain.com, Weather Tools and Calculators for ocean voyage planning and storm avoidance.